I don’t eat fries often but when I do it’s to treat myself after a tough week at work or after a big workout. Good fries are not hard to find in Chicago. The temptation is everywhere! Fries are vegan but not exactly healthy… This spicy, healthier recipe for fries is easy and will satisfy your craving without destroying your healthy eating goals for the day. You can enjoy a serving of these fries with less guilt. I’ve learned a lot about food from reading Michael Pollan’s books including Omnivore’s Dilemma. He recommends making your own fries when you crave them. That way you can control what goes in them. Making your own fries also allows you to appreciate and savor them more. The lemon garlic aioli is really the star of this recipe. It goes perfectly with the curry spices in the fries. If you like crispy fries make sure that you spread them out evenly so they aren’t touching on the baking sheet. I prefer softer fries so I tend to pile mine onto the baking sheet. These fries are incredibly flavorful and so easy to make. They contain less fat compared to traditional fries since they are baked not fried. The spices add a savory kick which complements the natural sweetness of the potatoes. I prefer sweet potatoes because they are high in vitamin A and have a lower glycemic index compared to regular potatoes. Let me know how they turn out by taking a picture and tagging @thefriendlyepicurean on Instagram! Preheat oven to 425F. Grease a baking sheet with olive oil spray and set aside. Wash, peel, and cut potatoes into 1/4″ to 1/2″ sticks. Toss potatoes with olive oil, cayenne pepper, cumin, garlic, coriander, salt, and black pepper. Spread fries evenly on baking sheet making sure fries do not overlap (for crispy fries). Bake for 30 minutes (flip half way through cooking time). For the aioli: whisk together lemon juice, mayonnaise, and minced garlic until smooth. Serve immediately. Store fries and aioli separately in an airtight container for up to 1 day. Reheat fries in oven or toaster oven at 350F for about 5-7 minutes. Stuffed mushrooms are one of my favorite appetizers. They look beautiful, have amazing flavor, and are so easy to make. I don’t mind spending more time making main courses but prefer that my appetizers are simple and quick. I used small portobello mushrooms because they hold just the right amount of filling and keep their shape. They require very little prepping: rinse them, dry them, pull off the stems and they are ready to go! The filling is herb-y, nutty, and has a little crunch. 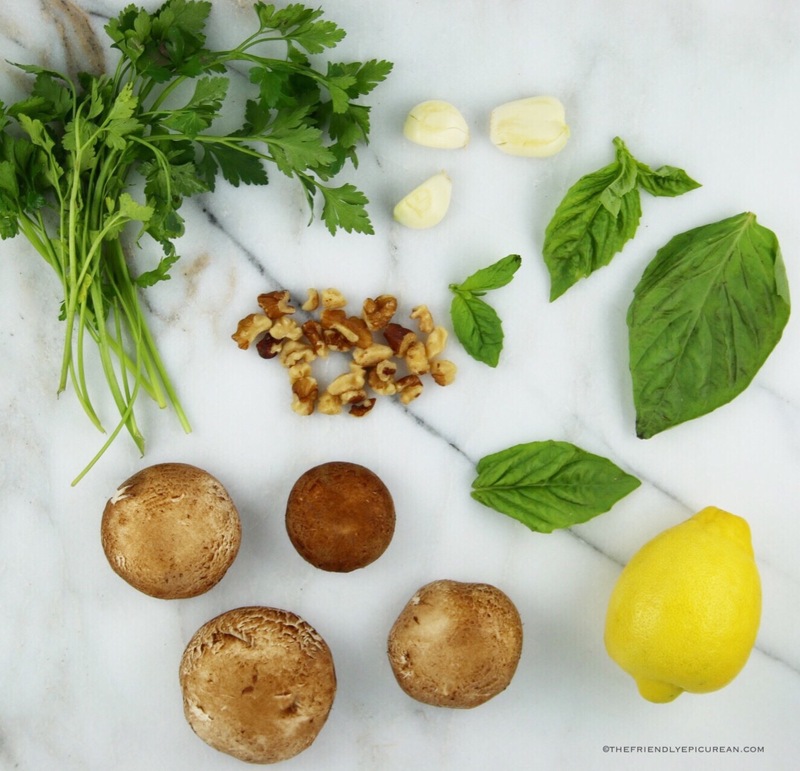 The basil and walnuts go really well with the portobellos. I like to use cooked garlic to lessen the intensity and allow the other ingredients to stand out as well. If you’re into lemon, adding some of the zest will also brighten up the flavors. These bite sized hors d’oeuvres are always a big hit at my house. They contain mostly whole ingredients and can be made gluten free by substituting gluten free breadcrumbs. The filling can be used to stuff other vegetables such as tomatoes and also as a topping for proteins such as tempeh or tofu. Let me know how they turn out by tagging @thefriendlyepicurean on Instagram! Preheat oven to 400F. Wash mushrooms and remove stems. Grease a baking sheet with olive oil spray and place mushrooms top down on baking sheet about 2 inches apart. Place olive oil, garlic, nutritional yeast, basil, parsley, and walnuts in a food processor or high powered blender (such as Vitamix). Blend on medium-high speed until mixture forms a paste like consistency. Next, add breadcrumbs and blend on low speed until mixture is crumbly. Stuff each mushroom with 1-2 tbs of basil mixture (depending on the size of the mushroom). Place mushrooms on greased baking sheet and bake at 400F for about 18-20 minutes. Serve immediately. Can be stored in an airtight container for up to 1 day. Serves 6 people. This recipe is my fast and healthy take on “risotto”. The lemon makes it fresh and bright and is delicious with the mushrooms and peas. This is a great way to get three vegetables in one meal. I like to eat warm dishes in winter – so this dish is great if you want to get your greens in and aren’t in the mood for a cold salad. It’s great for a quick weeknight meal and packs up well as leftovers for lunch the next day. It really does remind me of risotto but requires much less time and stirring. Bulgur is high in fiber and has a stickier texture like rice. It’s used in a lot of Middle Eastern dishes including tabbouleh. Bulgur only takes about 10 minutes make. I like it because it’s filling and has a neutral flavor that goes with almost anything. This dish doesn’t require much prep and can be made in just 30 minutes. Take a picture and tag @thefriendlyepicurean to let me know how it turned out! In a small to medium sized saucepan, heat bulgur and broth on medium heat. Bring to a boil and then lower heat and simmer on low heat for 10 minutes, stirring occasionally. Once water is almost completely absorbed, remove from heat and cover. Set aside. Heat olive oil on medium heat in a medium sized saucepan or dutch oven. Add onions and cook for about 8 minutes. Add garlic, salt, pepper, and rosemary and cook for another 3 minutes. Add mushrooms and cook for about 3-4 minutes. Next, add frozen peas and cook for another 3-4 minutes. Lower heat and add bulgur, lemon juice, lemon zest, and nutritional yeast. Add kale and cook for 1-2 minutes until kale is just wilted. May store in an airtight container in the fridge for up to 2 days. This healthy, dairy free version of cauliflower au gratin is a great dish for your next dinner party. It’s creamy, garlicky, and buttery without being too heavy. If you like to have extra sauce then you can easily double the butter, almond milk, flour, and nutritional yeast used to make the sauce. The nutritional yeast gives this dish it’s cheesy, nutty flavor. You won’t miss the cheese with this secret ingredient. The nutmeg adds a warm flavor and fragrance. This is comfort food with less guilt. It’s super easy and quick to make and contains less than 10 ingredients. As always, let me know how it turns out by tagging @thefriendlyepicurean on social media! Preheat oven to 350F. Grease a 11″ x 8″ baking dish with vegan butter and set aside. Add about 2″ of water to a large stockpot. Heat on medium heat until water is boiling. Place cauliflower into a steamer basket. Place steamer basket on top of stockpot and steam for about 8 minutes or until cauliflower is soft the whole way through. Or, place cauliflower in a large stockpot and cover with water. Bring to boil and cook for about 5-6 minutes or until cauliflower is soft the whole way through. Drain excess water from cauliflower and place in greased baking dish. Next, heat butter on low-medium heat in a small saucepan. Add garlic, salt, pepper, and nutmeg and cook for about 3 minutes. Add flour and stir. Then add almond milk and stir vigorously for 1-2 minutes with a spatula or heat safe whisk to remove any lumps of flour. Next, add nutritional yeast and continue to stir vigorously to remove any lumps. Simmer for about 3-4 minutes. Sauce should begin to thicken and reduce. Remove from heat and pour over cauliflower. Toss with a spatula to make sure cauliflower is coated evenly. Sprinkle with bread crumbs and remaining 1 tbs nutritional yeast. Bake at 350F for about 30-35 minutes. May store in an airtight container in the fridge for up to 1-2 days. I’m not a huge fan of carrots cooked on the stove top but roasted carrots are actually one of my favorite side dishes. These colorful and flavorful carrots will brighten up any meal. They’re super easy to make and are packed with flavor. The cumin, ginger, turmeric, and garlic go really well with the carrots and olive oil. The maple syrup is not overpowering and allows the carrots to caramelize a little and brings out their natural sweet flavor. Carrots are a great healthy alternative to other starchy vegetables such as potatoes. Roasting them imparts a delicious flavor and makes them taste like a more indulgent comfort food. If you’re running low on time, you can roast them whole. You can also use regular carrots but the multi-colored ones are always a huge hit with the kids in my family. Preheat oven to 425F. Grease a baking sheet with olive spray and set aside. Wash, peel, and cut carrots lengthwise. Then cut carrots into 3″ pieces. Toss carrots with olive oil, maple syrup, salt, ginger, turmeric, cumin, and garlic. Stir well to make sure ingredients are evenly distributed. Spread carrots on baking sheet in a single layer and roast at 425F for 20 minutes. Remove carrots from oven and flip with a spatula. Place carrots back in oven for another 5 minutes. Remove from oven and transfer to a serving dish. Top with chopped parsley and serve. May store in an airtight container in the fridge for up to 1-2 days. Recipe featured on The Feed Feed Delicious Desk Lunches on 12/2/16! Thanksgiving is almost here! This year, I wanted to make a healthy version of traditional stuffing. This dish is healthy, easy, and high in protein. It’s also lower in carbs than traditional stuffing. The vegetable broth and onions are savory and pair well with the sweetness of the cranberries. The pumpkin seeds add a nice crunch and the rosemary ties all of the flavors together nicely. If you are out of pumpkin seeds you can substitute chopped almonds instead. It’s the perfect side for your vegan, gluten free Thanksgiving dinner guests and can be made ahead of time. Let me know how it turns out by tagging @thefriendlyepicurean on Instagram, Twitter, and Facebook! Heat vegetable broth, quinoa, 1/2 tbs olive oil, salt, and pepper in a medium sized saucepan on medium heat. Simmer quinoa on low to medium heat until all of the broth is absorbed. Set quinoa aside. In a small saucepan or frying pan sauté onions in 1.5 tbs olive oil on medium heat for about 5 minutes until browned. Add garlic, celery, and rosemary and sauté for another 2 minutes. Combine onion mixture with cooked quinoa. Stir in cranberries and pumpkin seeds just before serving. Add more salt to taste if needed. Garnish with chopped parsley. May store in an airtight container in the fridge for up to 2 days. Makes 4.5 cups cooked quinoa.